My brother did this to me the night before he took his electrical engineering board exams. It’s so sabaw (stupid), I know, but he needed to de-stress and all so I played the role of a supportive sis and let him have a go at my forearm. 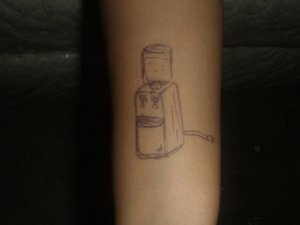 But OH MY GOD, he didn’t tell me he was gonna draw A WATER DISPENSER!!! I seriously didn’t see that coming. It’s a good thing he ended up placing 6th, or else all the snickering and humiliation I had to stand because the freaking “tattoo” wouldn’t come off for days would’ve been for naught. Before WordPress came into my life, I had Multiply for all the bits and pieces of me which I wanted to share with the digital world. Sadly, it will stop hosting blogs come December. 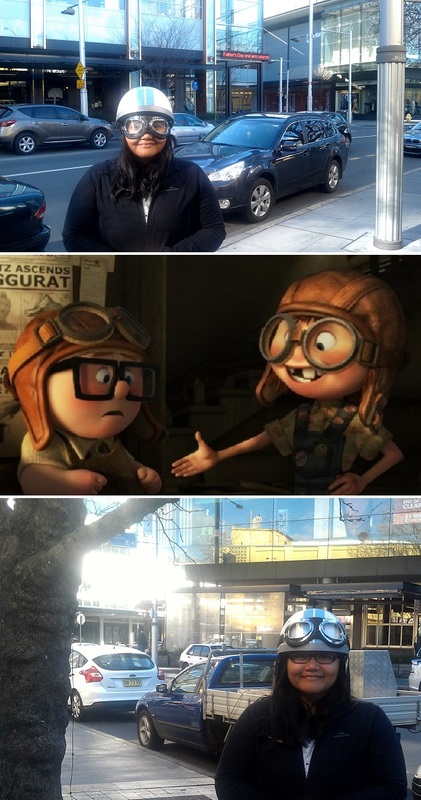 It’s Carl and Ellie and me! Here’s my attempt at channeling the lovable couple from the film: Ellie (“You know, South America. It’s like America, but South!”) and Carl (“Russell, don’t touch that. It could be… radioactive or something.”). I have yet to make up my mind regarding which character I channel better, but one thing I’m certain of is this unmistakable yearning in my heart to either find the man who’ll be my spirit of adventure…or meet the one who’ll make me his. 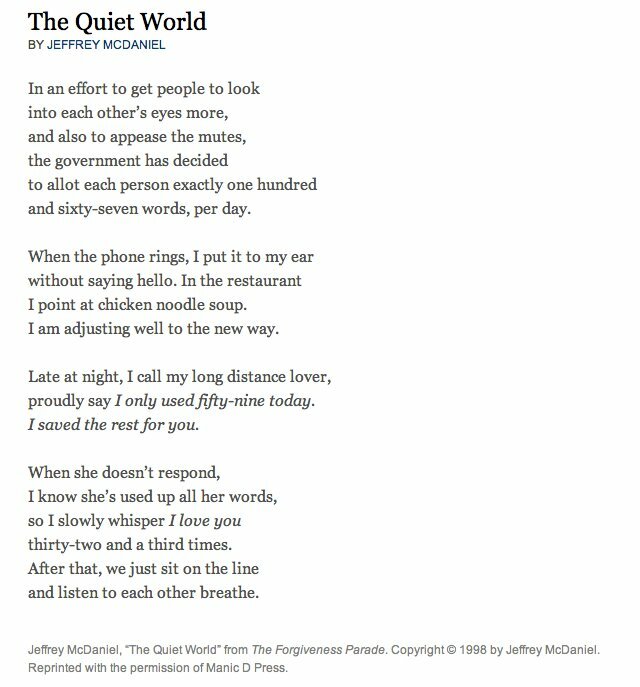 At about 15 minutes before midnight, the moment I got off my weekly Skype conference call with my sister who’s in Singapore and my parents and brother who are in Manila, this poem came to mind. We had been discussing for the nth time where we’d be during the holidays, who would be flying where, and from whose pocket the travel expenses would be drawn. In the end, we decided to celebrate Christmas in Manila, which means my sister won’t be with us come December 25. That’s terrible news for silly old me who’s been away all year, and who will be away again for most of 2013. All I wanted was a simple noche buena (Christmas eve dinner) for five. I know McDaniel’s piece isn’t familial at all, and I also have yet to find a lover whose breathing I would stay on the line for. But right now, many of the faces and places I hold closest to my heart are just too far away for comfort. There’s my bestest friend in the whole wide world who’s tying the knot in October and parents in their 60s who’ll be celebrating their birthdays soon, among others. There are a couple of people I’m itching to see, and it is my hope that they’re also itching to see me. But the thing is, the more I try to make up for the distance with all the sweetness and smileys and even silences I can cram into the correspondences I keep, the more I realize that slowly whispering 32 I-love-you’s just isn’t enough to bridge the miles between us. And even if I dare break the quota and say I love you for the 33rd time, that sadly won’t amount to much too. For nothing about using up all the I-love-you’s in the world can make me miss them any less. A shout-out goes to my friend Exxon Yu, who first made me aware of this short but moving poem. The snapshot of the poem above is also from him.